What was originally an 11-room hotel on a 17th-century plantation estate has evolved into a 340-acre resort with 138 rooms, suites and cottages, three crescent-shaped white-sand beaches, eight hard courts (two with lights), an 18-hole golf course, and a small spa and fitness center. Yet thanks to ownership by the Armstrong family, it has never lost its personal touch. Guests may no longer help rake the beach, as they once did, but they do feel very much a part of the resort. The tennis complex occupies a prime location: a terraced hillside just below the hotel overlooking the beach. Its covered wooden deck is a favorite place to gather after playing for the views of the Caribbean and on very clear days the islands of Tortola and Virgin Gorda in the British Virgin Islands. 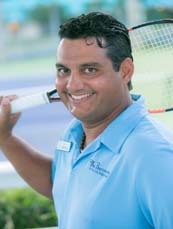 Tennis at the Buccaneer entered a new era in 2017 with the addition of Roman Ramirez as head tennis pro. A Top-10 ranked junior in his native Argentina, he went on to earn a degree in tennis degree with a specialization in tennis instruction and then to a career teaching and coaching, with posts at clubs and academies in Central and South America. 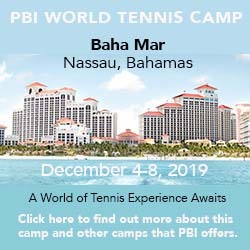 At the Buccaneer, he continues his work with juniors, both local and those staying at the hotel with their parents, while also adding another dimension to the resort's tennis offering as he runs drills and clinics for adults and gives private lessons. On any given morning at the Buccaneer you'll hear the thwock, thwock of tennis balls and may look out to see nearly all of the eight courts in use. Some of those players will be hotel guests, who have first priority; many, however, will be local members for whom this is their home club, drawn either by the opportunity to play o r by the weekly social mixers, round robins, clinics, and drill sessions. That combination ensures a stable of players for guests looking for games and generally improves the turnout for the various weekly programs scheduled during the busy winter season. And it has another advantage: many guests come specifically for the tennis, not just to play, but knowing that they'll run into some of the same people—guests or locals—year after year. The Buccaneer has a reputation as a place where lasting friendships begin on the courts. Courts & Fees. There are 8 hard courts (2 with lights) arranged on two terraces cut into the hillside below the main hotel and above Mermaid Beach. Court fees (for guests): $20/court/day, $34/court-hour nights. Lodging consists of hotel rooms, cottages, hotel suites, and luxury oceanfront suites. Travel Instructions. Three major airlines serve St. Croix from the U.S. mainland: American, Delta, and JetBlue, making stops in St. Thomas or San Juan, Puerto Rico en route. General Tourist Information. For detailed information about the island of St. Croix, contact the St. Croix Hotel & Tourism Association at 800-524-2026. For general tourist information, contact the U.S. Virgin Islands Department of Tourism at 800-372-USVI or visit its offices in Atlanta, Chicago, Los Angeles, Miami, New York, or Washington, DC. Among other things, it publishes a brochure that outlines rates at resorts, hotels, and inns on St. Croix, St. John, and St. Thomas.